Torquay United boss Kevin Nicholson says on-loan striker Achille Campion deserves better luck after breaking his nose in the 3-1 loss to Lincoln City. He could be out for two weeks if he is unable to play with a protective mask. 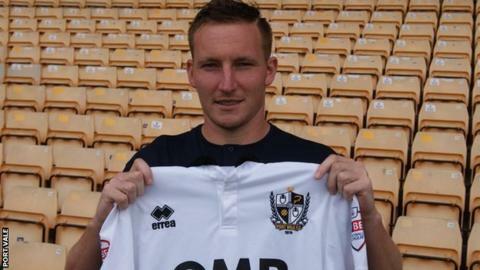 The Port Vale forward's loan has been hindered by a postponement and being substituted for tactical reasons after a team-mate was sent off. "I hope he gets back fit and firing because he deserves it as he's a great character," said Nicholson. Campion's loan spell runs out at the end of the month with the club unsure yet if they will extend it. "He wanted to come here and play and his first game got called off," Nicholson told BBC Radio Devon. "In his second game he came on and a man got set off two minutes later, he played half-an-hour, if not more, last week down to 10 men and now he gets his nose broken and is out for two weeks."